Anna Boncompagni, "Wittgenstein and Pragmatism: On Certainty in the Light of Peirce and James"
This book investigates the conflicts concerning pragmatism in Wittgenstein's work On Certainty, through a comparison with the pragmatist tradition as expressed by its founding fathers Charles S. Peirce and William James. 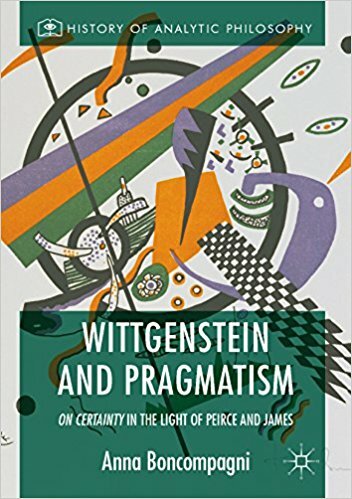 It also describes Wittgenstein's first encounters with pragmatism in the 1930s and shows the relevance of Frank Ramsey in the development of his thought. Offering a balanced, critical and theoretical examination the author discusses issues such as doubt, certainty, common sense, forms of life, action and the pragmatic maxim. While highlighting the objective convergences and divergences between the two approaches, the volume makes links to ongoing debates on relativism, foundationalism, scepticism and objectivity. It will be of interest to anyone searching for new perspectives on Wittgenstein's philosophy.